I haven’t been keeping up with Castle this season, so I don’t know whether this is normal now, but this was heavier on the melodrama than I really like. Now, there was also plenty of charm in this episode, particularly at the beginning. 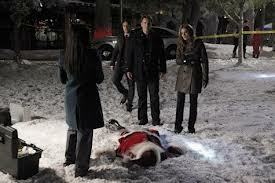 Castle and Beckett investigate a dead man in a Santa suit who, predictably, fell mysteriously out of the sky. The case is interesting, and the banter is fun, but all the little sad subplots about the various characters got a bit tedious. Not every named character needs angst! All of that said, I did still enjoy watching this. I don’t know how much fun it is in total for someone who isn’t familiar with the show, but Erin seemed to really enjoy the first half or so, although by the end he was rolling his eyes a bit. Castle is a quirky cop drama, fundamentally, and you have to embrace that if you’re going to enjoy it. It’s formulaic, and this episode tries to be a little more emotionally heavy than I think the cast really pulls off, but it’s a decent holiday treat overall.